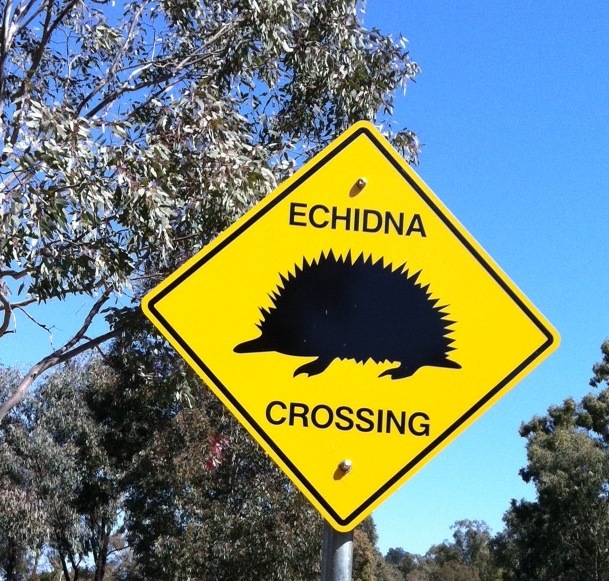 This is, obviously, an echidna crossing sign. It is on the CSU campus in Wagga. We haven’t seen an echidna yet, but obviously it is some sort of porcupine-like creature. Knowing the Aussie way of renaming things, it might just be a porcupine. But then, if that were the case, they would probably just call it a porkie. Or a porco. Anyway, it is one of those signs, like the kangaroo crossing sign (too common to bother replicating here) that Lisa constantly has to explain to Dan that it is a warning, not a promise. He gets a bit annoyed when we drive past an animal crossing sign and he doesn’t get to see one. You’d think he would have learned with all those those elk crossing, moose crossing, bear crossing, etc…signs in the Rockies. Warning. Not promise. Though we don’t think the kangaroo crossing sign is worth showing, these ones are. These are just two of the different styles of koala crossing signs you can see (Lisa’s favourite is the one that waves as you drive by; we’re not sure if real Koalas actually do this). We don’t have any of these signs right around Wagga; probably the only ones in the Riverina would be around the koala reserve near Narrandera but we haven’t been there yet (waiting for the annual koala count in April!). But we did see a lot of them in Victoria, south of Wangaratta. These aren’t photos that we took…these were gleaned from other people’s websites. Why we don’t have our own photos still baffles us. When you leave Wangaratta driving south toward Melbourne, for about an hour you see these constantly. You are on a divided highway, 2 lanes each direction, lined with eucalyptus trees. Perfect koala territory. As we drove through it, we kept saying we would get photos on the way back. Well, for some inexplicable reason, the northbound highway (50 metres to the west of the southbound one) has no koala signs. Talk about things that make you go “Huh?” Why do the koalas cross one part of the highway and not the other? All we could figure out was that the northbound lanes had a rail line running parallel to them, about another 50 metres east, so the koalas stuck to the safer side. Too bad the grizzlies in Banff area weren’t that smart. 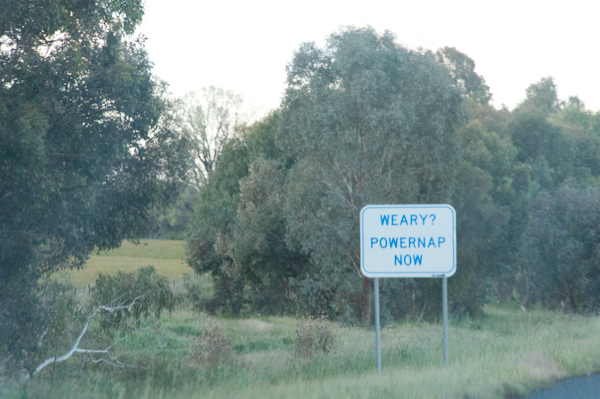 This is one of our favourite signs in Wagga. This is near the Murrumbidgee Turf Club (where the thoroughbreds race, on grass, as opposed to the dirt track at the Wagga Showgrounds where the trots take place). You see signs like this in all the towns around the Riverina. Obviously, there is an abundance of poo. 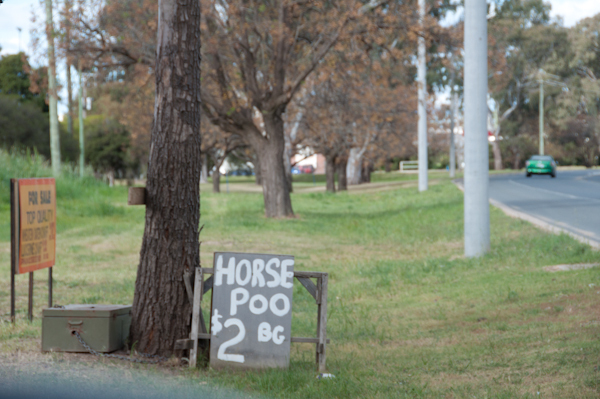 Horse poo generally goes for $2 a bag; sheep and cow poo is a bit more. But we think that maybe the people selling horse poo need to take a lesson in marketing: it is always $2 a bag, but there is never any there. Obviously the demand is higher than the supply, so they should be able to up the price to at least $2.50 a bag. Note the honour box beside the tree, where you can leave your gold coin. This is one you have to click on to see larger to really understand. Cowra is a town about 1/2 way between Wagga and Bathurst. Given that Bathurst is a frequent destination for us for work purposes, we pass through Cowra quite often. 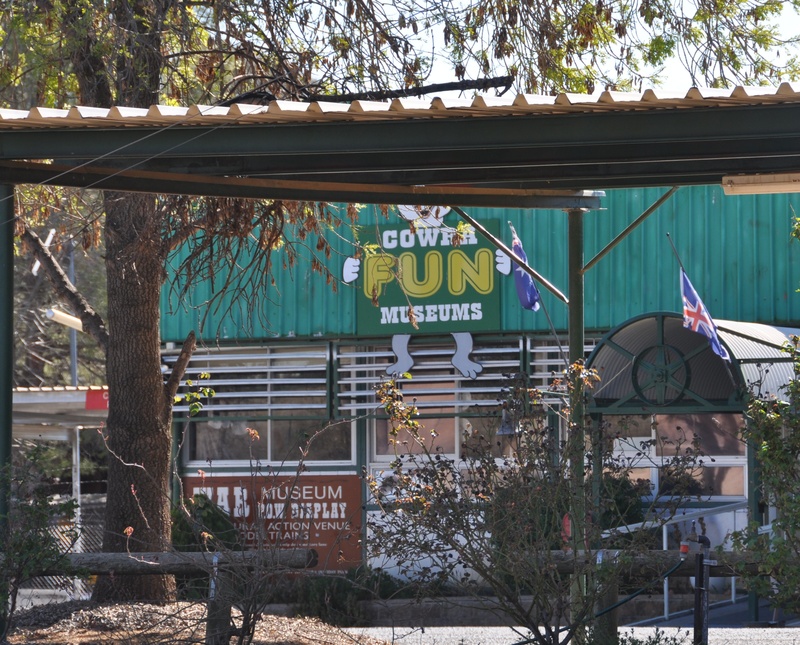 It has a nice rose garden in the centre of town, and on the outskirts it has the Cowra Fun Museums. No idea what they are about (and no idea if they actually pay Warner Brothers for using Bugs Bunny – you can’t see it well in this photo, but that wascally wabbit is holding the sign). Besides the rose gardens, Cowra has two other claims to fame. One is that it is a a wine region, getting a short (and not overly flattering) entry in Hugh Johnson and Jancis Robinson’s The Concise World Atlas of Wine (but we’ve had some good Cowra wines… Pig in the House shiraz is worth the money just for the story on the label!). Cowra’s other claim to fame is that it was where several Japanese POWs were imprisoned during World War 2. At some point, they attempted to escape and some Australian soldiers and most of the Japanese prisoners were killed in the ensuing battle. There is a great story about how the people of Cowra didn’t hold a grudge, treated the bodies with respect, and instead of repatriating the corpses the Japanese government decided to build a memorial garden in Cowra. All a sweet little story really. So, what does this have to do with the Fun Museums? We don’t really know, but if you look closely at the sign, you will see that the War Museum and POW Display is part of the Fun Museums…yes, really. Maybe some day we will stop and see just how fun it is. No, this isn’t reference to the Gillard government’s Malaysian Solution or Christmas Island (there aren’t enough e’s on this sign). 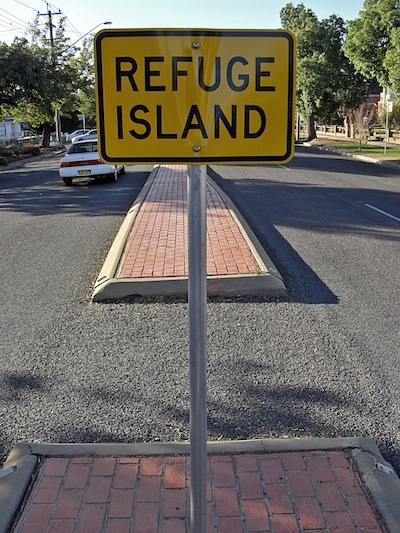 But just like refugees crowding onto unsafe boats to make the ocean crossing to Australia, pedestrians in Wagga are risking their lives and have no rights. These signs are in the middle of the road at roundabouts in the CBD. Basically, if you want to cross, you scoot as quickly as you can to the middle of the road and stand in this area until it is safe to cross the rest of the way. Supposedly the metal sign pole and the 3 inch kerb will protect you from oncoming traffic. That, or you can just wait a few seconds for the traffic to clear…it isn’t that busy, and unless you are really eager to cross, it will be safe to do without risking your life pretty soon. This entry was posted in Australia, Cowra, danger, driving, horse poo, kangaroo, koalas, Melbourne, Riverina, road signs, traffic signs, wagga, wagga wagga. Bookmark the permalink. These signs are amazing. I’d probably camp out at the koala one until one crawled out eventually…then it’d go into my backpack and back home with me. Koalas are good playmates for cats, right? Wait! Don’t give Dan any ideas! We’re pretty sure that our cat Malachi would take out any Koala that came into our house… but Lester would just like to cuddle with him. We suspect that going to the Koala reserve at Narrandera is a more efficient approach for stealing a Koala, but also mindful that this would be illegal (gotta keep our visas clean, after all). I immediately did a Google Image search for “cat and koala” after thinking how adorable that would be, and to my disappointment all I found were cats named Koala, Lolcats in koala-like poses, and cats cuddling with stuffed koalas. Alas, perhaps it is not meant to be, sorry Lester!